Forex, or foreign exchange, trading is an international market for buying and selling currencies. It is similar to the stock exchange, where you trade shares of a company. Like the stock market, you don't need to take possession of the currency to trade. Investors use forex trading to profit from the changing values of currencies based on their exchange rates. In fact, the foreign exchange market is what sets the value of floating exchange rates. All currency trades are done in pairs. You sell your currency to buy another one. Every traveler who has gotten foreign currency has done forex trading. For example, when you go on vacation to Europe, you exchange dollars for euros at the going rate. You are selling U.S. dollars and buying euros. When you come back, you exchange your euros back into dollars. You are selling euros and buying U.S. dollars. The most familiar type of forex trading is spot trading. It's a simple purchase of one currency using another currency. You usually receive the foreign currency immediately. It's similar to exchanging currency for a trip. It's a contract between the trader and the market maker, or dealer. The trader buys a particular currency at the buy price from the market maker and sells a different currency at the selling price. The buy price is somewhat higher than the selling price. The difference between the two is called the “spread.” This is the transaction cost to the trader, which in turn is the profit earned by the market maker. You paid this spread without realizing it when you exchanged your dollars for euros. You would notice it if you made the transaction, canceled your trip and then tried to exchange the euros back to dollars right away. You wouldn't get the same amount of dollars back. The largest component of currency trades is foreign exchange swaps. Two parties agree to borrow currencies from each other at the spot rate. They agree to swap back on a certain date at the future rate. Central banks use these swaps to keep foreign currencies available for their member banks. The banks use it for overnight and short-term lending only. Most swap lines are bilateral, which means they are only between two countries' banks. Importers, exporters, and traders also engage in swaps. Many businesses purchase forward trades. It's like a spot trade, except the exchange occurs in the future. You pay a small fee to guarantee that you will receive an agreed-upon rate at some point in the future. A forward trade hedges you from currency risk. It protects you from the risk that your currency’s value will rise by the time you need it. A short sale is a type of forward trade in which you sell the foreign currency first. You do this by borrowing it from the dealer. You promise to buy it in the future at an agreed-upon price. You do this when you think the currency's value will fall in the future. Businesses short a currency to protect themselves from risk. But shorting is very risky. If the currency rises in value, you have to buy it from the dealer at that price. It has the same pros and cons as short-selling stocks. Foreign exchange options give you the right to buy a foreign currency at an agreed-upon date and price. You are not obligated to buy it, which is how an option is different from a forward contract. This figure is on a net-net basis. It excludes the duplicate book entries that occur when currency is traded between countries. When those entries are included, which is called a gross-gross basis, the total is $6.514 trillion. Trading is down slightly from the record $5.357 trillion traded in April 2013. That’s a result of a slowdown in the spot trading market. In 2010, $3.9 trillion traded in forex per day. In 2007, the pre-recession high hit $3.324 trillion traded per day. Forex trading kept growing right through the 2008 financial crisis. In 2004, only $1.934 trillion was traded per day. In April 2016, 88 percent of trades happened between the U.S. dollar and some other currency. The euro is next at 31 percent. That’s down from 39 percent in April 2010. The yen carry trade returned with force. Its trades rose from 17 percent in 2007 to 22 percent in 2016. Trading in the Chinese yuan more than doubled from 2 percent in 2013 to 4 percent in 2016. The chart below from the BIS shows the top 10 currencies and the percent of global currency trades in 2016. Banks are the biggest traders, accounting for 24 percent of daily turnover. It is a source of revenue for these banks that saw their profits decline after the subprime mortgage crisis. Investment companies always look for new and profitable ways to invest. Currency trading is a perfect outlet for financial experts who have the quantitative skills to invest in complicated areas. Hedge funds and proprietary trading firms come second and contribute 11 percent. Although they represent a smaller proportion, their trading is increasing for the same reason as the banks'. Pension funds and insurance companies are responsible for another 11 percent of the total turnover. Corporations contribute just 9 percent. Multinationals must trade foreign currencies to protect the value of their sales to other countries. Otherwise, if a particular country's currency’s value declines, the multinational's sales will too. This can happen even if the volume of products sold grows. Forex volatility is declining, reducing the risk for investors. In the late 1990s, volatility was often in the teens. It sometimes rose to as high as 20 percent with U.S. dollar versus yen trades. Today, volatility is below 10 percent. This number takes into account historical volatility, or how much prices went up and down in the past. It also includes implied volatility. That's how much future prices are expected to vary, as measured by futures options. Why is volatility lower? One, inflation has been low and stable in most economies. Central banks have learned how to measure, anticipate, and adjust for inflation. Two, central bank policies are more transparent. They clearly signal what they intend to do. As a result, markets have a lower chance of overreacting. Three, many countries have also built up large foreign exchange reserves. They hold them either in their central banks or sovereign wealth funds. These funds discourage the currency speculation that creates volatility. Four, better technology allows for faster responses on the part of forex traders. It leads to smoother currency adjustments. The more traders there are, the more trades occur. This contributes to additional smoothing in the market. Five, more countries are adopting flexible exchange rates, which allow for natural and gradual movements. Fixed exchange rates are more likely to let the pressure build up. When market forces overwhelm them in the end, it causes huge swings in exchange rates. This is true in particular for emerging market currencies. Flexible exchange rates will make them more important global economic players. The "BRIC" countries (Brazil, Russia, India, and China) seemed impervious to the recession until recent times, so forex traders became more involved in their currencies. In 2013, some of these countries started to falter, leading to an exodus and fast depreciation of their currencies. The BIS was surprised that the recession didn't affect the growth of forex trading as it did for so many other forms of financial investments. A BIS survey found that 85 percent of the increase was due to increased trading activity from "other financial institutions." Just a few high-frequency traders do most of the trades. Many of them work for banks, who are now increasing this area of their business on behalf of the biggest dealers. Last but not least is an increase in online trading by retail (or ordinary) investors. It has become much easier for all of these groups to trade electronically. This shift is compounded by algorithmic trading, also called program trading. Computer experts, or "quant jocks," set up programs that automatically conduct trades when certain parameters are met. 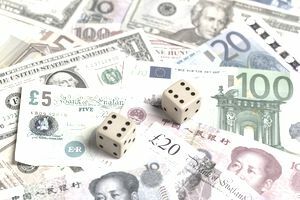 These parameters can be central bank interest rate changes, an increase or decrease in a country's gross domestic product, or a change in the value of the dollar itself. Once one of these parameters is met, the trade is automatically executed. Overall, lower volatility in forex trading means less risk in the global economy than in past decades. Why? Central banks have become smarter. Also, the forex markets are now more sophisticated. That means they are less likely to be manipulated. As a result, dramatic losses based on currency fluctuations alone, like we saw in Asia in 1998, are less likely to happen. Traders still speculate in the forex market though. In May 2015, four banks (Citigroup, JPMorgan Chase, Barclays, and Royal Bank of Scotland) admitted to rigging foreign exchange rates. They join UBS, Bank of America, and HSBC, who have already admitted to price fixing and colluding with each other to manipulate foreign exchange rates. The investigation is related to the Libor investigation. Even without outright price fixing, traders can create asset bubbles in foreign exchange rates. It may have happened with the U.S. dollar in 2014 and in the last quarter of 2008. A strong dollar makes U.S. exports less competitive. It slows GDP growth. If traders bid the dollar down, then oil-producing countries will raise the price of oil, because oil is sold in dollars. The expansion of forex trading needs to be better regulated in order to avoid potential bubbles and busts.